Inside: The sweetest printable DIY bouquet holders. 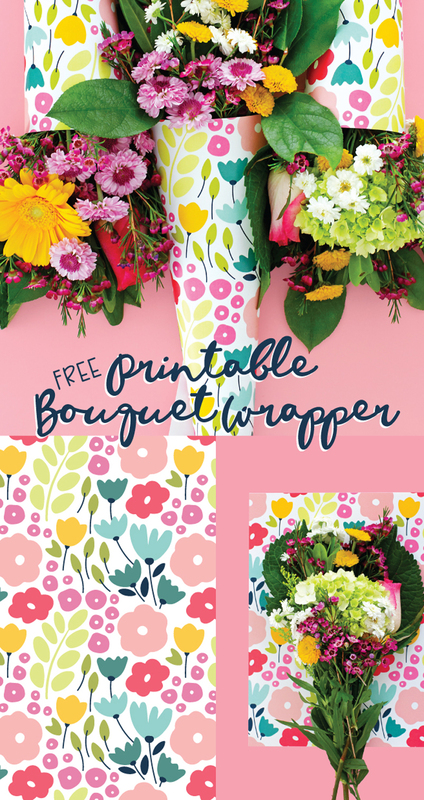 I guarantee whoever the lucky gal or fella receiving your flowers, will definitely notice the extra thought put into their bouquet with this added printable wrapper. 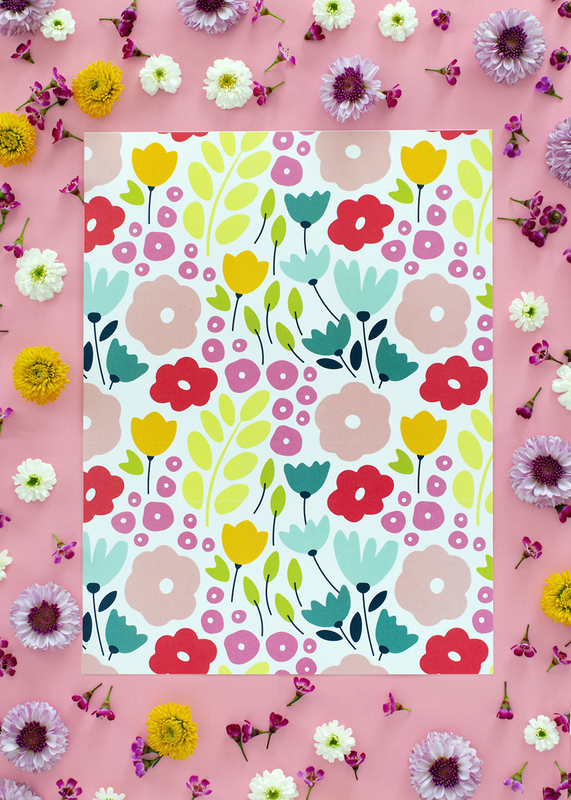 Since I’m a HUGE fan of color, I included lots of bright hues into my pattern to match any bouquet color palette you buy. Plus, since spring is fast approaching, beautiful blooms will soon be popping up everywhere. 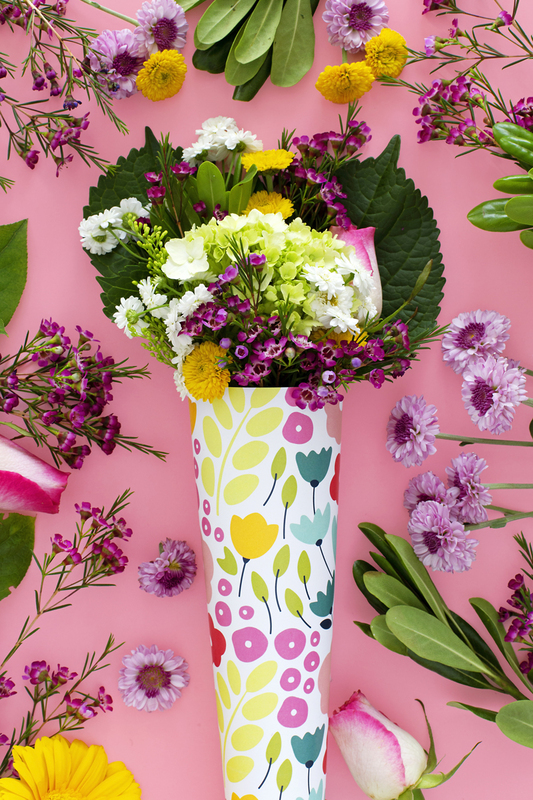 Take a walk through your yard, or a find a patch of wildflowers in the mountains, then wrap your freshly picked blossoms in this simple spring inspired DIY bouquet holders, gifting a bouquet of flowers you picked yourself. And how to make paper flowers incase the real ones don’t cut it. 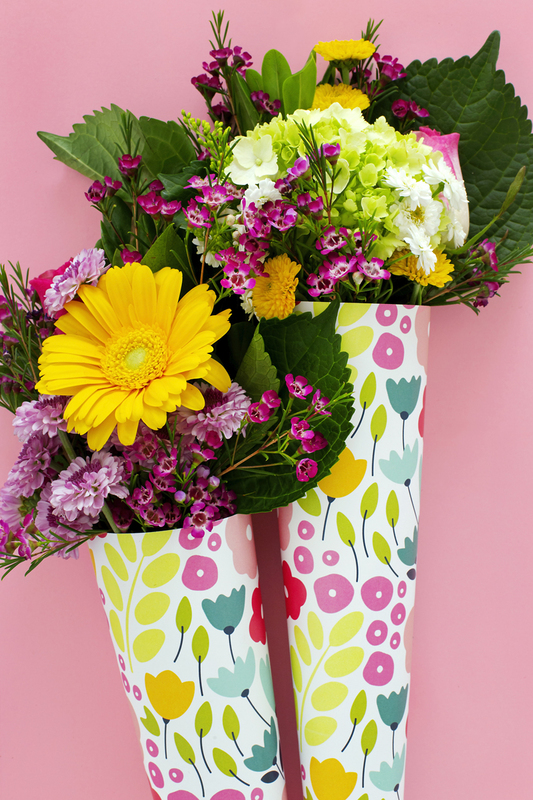 Step One: Download the FREE, PDF paper bouquet holder template. Set your printer settings to no margins, so that your bouquet wrapper doesn’t print with a white wrapper around the edge of the design. If your printer doesn’t have that setting, it should only print with about an eighth of an inch border, which can easily be trimmed with scissors or a paper cutter. 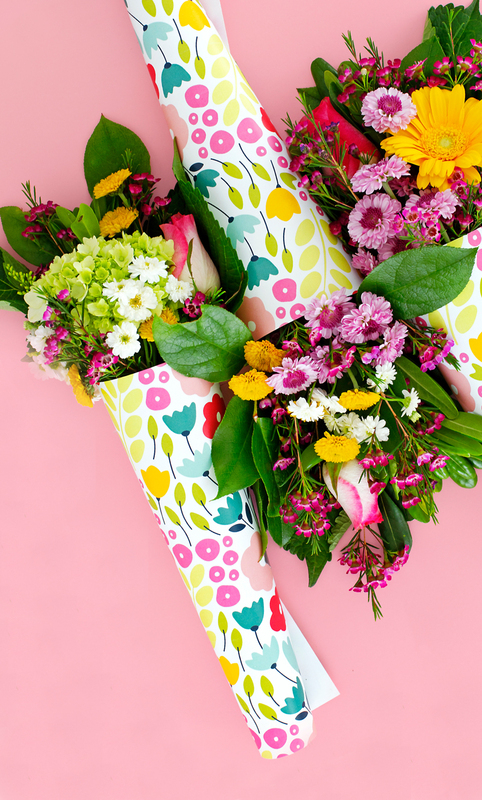 Step Two: Remove the cellophane wrapping from your store-bought bouquet, or gather your freshly picked blossoms, and wrap the bouquet with the DIY bouquet holders, securing with tape. I found forming the cone BEFORE you wrapped it around the flowers was A LOT easier than forming the cone around the flowers first. So I suggest making the cone, securing the edge with tape, and then placing the blooms inside the cone last. Optional If you aren’t gifting your DIY bouquet holders and flowers right away, wrap the bottom of the bouquet in wet paper towels, and putting the end of the stems with the dampened towels, into a zip lock bag. This will preserve your flowers until you are able to gift them. 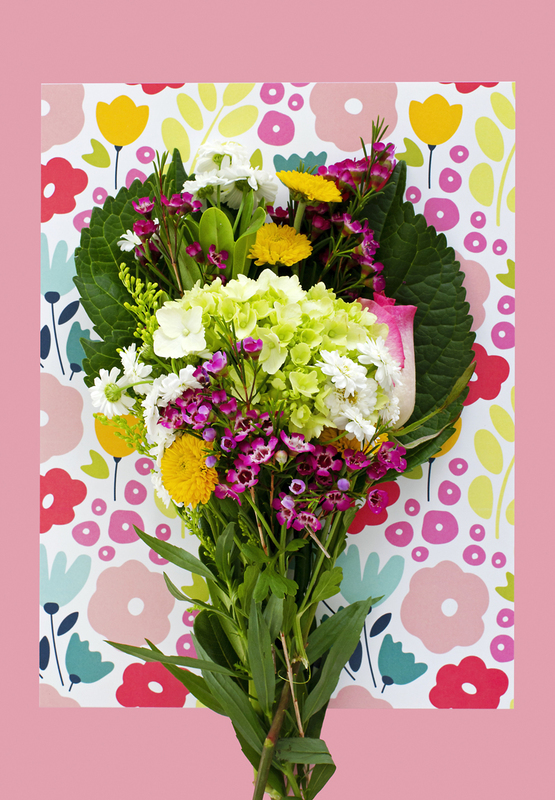 We have a few more stunning DIY bouquets for this Valentine’s day! First up, the perfect bouquet for the man in your life. It may not be pretty but its beefy, and what man doesn’t love beef? Or if you’re like me and love flowers, but also love cupcakes, this cupcake flower bouquet is the one for you! And last, if you want to give the pretty bouquet that will never die. These paper flowers are the best flower bouquet DIY!